by A.E.Truckell, M.A., F.M.A., F.S.A.Scot. Doctor Grierson received a grant from the Duke of Buccleuch of land at the end of New Street, and a Museum building and house took shape there, being begun in 1869 and opened to the public in 1872. The Doctor was a man of keen intelligence and omnivorous interests, and had an exceptionally attractive character: he was a warm friend and correspondent of many famous 19th-century scholars, scientists and travellers: thus his Museum of 4,000-odd catalogued specimens (and many more) and Library of 3,000-odd books contained much of real importance as well as reflecting a remarkable and unusual personality. Left, with inadequate funds, to a Trust on his death late in 1889, it languished for many years: finally the Department of Education for Scotland held a local Enquiry and drew up a Scheme which on 24th June, 1965, became an Order in Council, under which a Committee of the Dumfriesshire Educational Trust was to disband the collection, giving first choice to local institutions. As the collection has now been dispersed, and as a good deal of the material is either recorded as being "at Thornhill," or has received insufficient attention, the table which follows gives some of the more important items and their present locations. All items listed as "local" are from the Society's three counties - Dumfries, Kirkcudbright and Wigtown - and have been transferred to Dumfries Museum except where otherwise stated: present locations are given for non-local items. The table relates only to material in public institutions and not to articles - mainly in the recent and ethnographic brackets, and books - disposed of to dealers. A good representation of WANLOCKHEAD minerals: antimony from GLENDINNING and THE KNIPES, haematite from AUCHENCAIRN: amethyst from BORELAND, among local sites. British, Continental, American, African, Asiatic and Australian minerals are well represented and have been retained as a teaching collection at Dumiries. Notable geologists who contributed to the geological collection include Geikie, Hugh Miller, Plant, and, locally, Patrick Dudgeon, Dr. Gilchrist and Dr. Wilson of Wanlockhead. Ordovician and Silurian. Several fine large "tuning-fork" Graptolites from WANLOCKHEAD. Carboniferous. A large and important representation, mainly marine fossils, from CLOSEBURN limestone quarry: large Nautiloids, large and very complete Orthocerids, and large Productids, are especially prominent. There are a few very fine fern impressions and plant stems. While most of this group is at Dumfries small selections went to the Royal Scottish Museum, Edinburgh University, the Hunterian Museum and Glasgow City Museum. There is also a good representation of fern impressions and plant stems from the SANQUHAR and KIRKCONNEL coal measures. The very large collection of English, European and American fossils has been retained at Dumfries as a teaching collection. There is a particularly strong group of Barrow Lias specimens. Structural Geology. This small group has been retained at Dumfries. It includes local and foreign material. The Herbarium collection was much decayed but a considerable amount remained in good condition: this has been rearranged, and contains a proportion of local specimens. Two bi-triangular Arrowheads<, LUCE SANDS. Polished Stone Axes: DALBEATTIE, BARNDENNOCH (Keir), BALTERSAN, TERREGLES, BARHILL (Keir), INGLESTON RIGG, CARSON'S PARK (Auchenhessnane), BYREHOLM (Keir), DURISDEER, and DUMFRIES. Hammer-stone and anvil-stone, LUCE SANDS. Barbed and tanged, LUCE SANDS; STANDING BRAE, Farding, Keir; POLSKEOCH, Penpont; BARDENNOCH, Keir (chert); TOWNHEAD, Closeburn. Piano-convex flint knife from cist in cairn at BARDENNOCH (Keir). GLASSERTON, Wigtownshire; AUCHENAGE (Keir), KIRKPATRICK-DURHAM, KEIR MILL, OLD GAITSLACK, BALTERSAN (Holywood), PARK OF CLOSEBURN, HOLYWOOD, HIGH KILROY, GREENHEAD (Closeburn), BLACKPARK, WHITEHALL (Kirkmahoe). Small neat axe-hammer in igneous stone from a cairn at TYNRON. Partly perforated small pink quartzite hammer from FAIRHOLM, Lockerbie. Small deep perforated hammer from BALAGGAN (Durisdeer). Flattened hammer with very small perforation, local. Small deep perforated hammer from COSHOGLE, Durisdeer. TINWALD (quartzite, beautifully made); DALGARNOCK, Old Churchyard. Carved Quartzite Ball, CREE MOSS. Ring of mottled claystone, HOLSTANE, Durisdeer. Jet Ring one and three-eighths inches external diameter, LOCHAR MOSS. Melon bead in green vitreous paste, BAITFORD, Penpont. Ring-bead of brownish-yellow glass, BLACKWOOD, Keir. Unfinished stone ring, HOLSTANE, Durisdeer. Small Whetstone from beside Sanquhar Crannog site. Hammerstone, crannog in Craigenveoch Loch, Wigtownshire. Ballista Ball from Burnswark- presented to Dr Grierson many years before the 1898 excavation. Large melon-shaped glass bead with blue, red and white ornament-local but no site named. Stone Mould for casting something like a wide-toothed comb, ENTERKINFOOT. Tripod Ewer, brass, with animal-head spout, from moss at BEUCHAN, Keir. Tripod Pot, brass, ornamented with raised chevron band: two lugs: from peat-moss at APPIN, Tynron. Tripod Pot, brass, from peat-moss at DRUMBUIE, Kells. Dagger from field next to TIBBERS Castle-l3th-l4th century. Small piece of Chain Mail from Kinnel Water near Moffat. Green-glazed Tiles from MORTON Castle. Green-glazed pottery, etc., Crannog in Friars' Carse Loch. Small l3th-14th century grave-cover bearing a dagger, unprovenanced but probably from WOODREAD, Penpont. Large quern-stone with cross in relief. Ornamented bronze bell for harness, found in Roman fort field at BANK-HEAD, Dalswinton. Key, site of DUMGREE Church, Annandale. Forked Bronze object, HOLYWOOD Churchyard. Coins found in Mid-Nithsdale, and presumably part of the several large hoards found there over the past century and a half - l7 Edward Sterlings, Richard III Groat and sterling, Alexander III Sterling, James IV silver Plack, Billon Plack, James IV or V, Q. Elizabeth Shilling. Wooden Spades, found in peat at Closeburn and at MERKLAND, Dunscore. Spindle-Whorls (see Addenda Antiquaria, p.149 infra): DURISEER (3), Local but no precise find-spots (14), GLENCAIRN (2), BLACKWOOD (1), KIRKCONNEL (2), GLENGAP, Sanquhar; CLOSEBURN (2), ENOCH, Durisdeer; DURISDEER Churchyard: COSHOGLE, Durisdeer (2): ALLANTON Mill, Dunscore: BARNHILL, near Dumfries: DRUM, Morton: LANDS, Tynron: NEWABBEY parish: FINGLAND, Dalry: one "found under the hearthstone of an old house in Galloway": one from STEPENDS, Penpont: one from KIRKGUNZEON parish: one from KIRKCONNEL parish: one from DRUM-CRUIL, Durisdeer, and one from CORSOCK. Small collection of Dumfries 16th-century documents. Three carved oak panels, local, early 17th cent. Piece of carved oak Pulpit of Glencairn Church bearing date 1607. Piece of Chest broken up in Closeburn and bearing date 1606. Richly-ornamented collecting-box, 17th cent. : bears intricate pattern of rosettes and swags and much stamped ornament. Large collection of locally made or found 18th and early 19th century material in the field of agricultural and craft and domestic implements, dress, crockery and the like, including two attractive wooden spice or snuff mills, one of them from Annandale, wrought-iron brackets for holy-water stoups from local churches, and a tally-stick giving a reckoning of the hill drains on Glenmaddie, Sanquhar. Royal Scottish Museum, Edinburgh University, Zoology Dept. of Glasgow University: mainly skeletal material. Royal Scottish Museum, Glasgow City Museum, Durham University and Leicester University, the latter receiving some Danish archaeological material - a flint dagger from North Oland and a flint axe from Angeln. The ethnographic collection was 'of good early material and world-wide in its scope: in addition to recent material, North American archaeology was strongly represented. Dumfries has retained for teaching purposes the Egyptian, Assyrian, and some of the Central and South American material, several pieces of a fine late-classical lead sarcophagus (see Article p. 80 infra) and a selection of the 18th and early 19th century ethnographic material. Polished Stone Axe, Strathdon - Aberdeen City Museum. Axes from BORLAND Smithy, Old Cumnock, and from DRUMBOWIE, Ochiltree, both in Ayrshire - Glasgow City Museum. Leaf-arrowhead, Banffshire - National Museum of Antiquities. Barbed tanged arrowhead in cherty flint, and a flake showing secondary working, both from Strathdon - Aberdeen City Museum. Barbed tanged arrowhead, Inveraray, Aberdeenshire - Aberdeen City Museum. Barbed tanged arrowhead, Banffshire - National Museum of Antiquities. Flint Dagger, Glenochar, on the Portrail (or Potrail) Burn, Crawford Moor - National Museum of Antiquities. Bronze Leaf-sword from Doonally, near Gort, Galway-National Museum of Ireland, Dublin. Cinerary Urn fragments, BORLAND, Old Cumnock - Glasgow City Museum. Urn fragment, CARLIN HILL, Coylton - Glasgow City Museum. Urn fragments from estate of STIRLING in Stirlingshire - Stirling Museum. Blue glass Melon Bead, Castle Newe - National Museum of Antiquities. Quartzite Pebble from underground house, Castle Newe - National Museum of Antiquities. Triangular bead of white vitreous paste inlaid on the surface with yellow enamelled spirals from Strathdon - Aberdeen City Museum. Tripod Brass Pot from FELL BOG, Winterdleuch, Lanarkshire - Glasgow City Museum. Spindle-whorls not relating to Dumfries and Galloway have gone to their local Museums. The National Museum of Antiquities and Glasgow Museum have taken a selection of 19th century industrial and craft material: the Royal Scottish Museum have taken a selection showing 19th century uses of natural history material. Local books from the Library have been divided between Dumfries County Library and Durnfries Museum: other books have gone to libraries over most of Scotland - the law books, for instance, to the law department of Queen's College, Dundee - and to dealers. A good deal of material not of interest to Museums, mainly in the Recent and Ethnography sections, was disposed of to dealers. The purpose of the Doctor's museum was strongly didactic: from the beginning he used it as a teaching centre, with a lively group of young people being stimulated to do research in, or based on, his Museum. In addition to the Thornhill Institute, founded by him in 1850, and very closely linked with the Museum and its library (which functioned as a lending library), school visits were frequent and made a great impression on the children. He had reduced-fee or free days for children - on one of these, 1st January, 1863, he held a competition among the large number of boy and girl visitors as to who could give the longest and most accurate list of objects in the Museum: the winner,John Williamson, named 170 items. 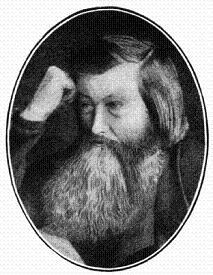 His displays relating to particular industries - building, foundry-working, textiles, telegraphy, printing, glassmaking, candle-making - even false-teeth making - and his very large collection of plant raw materials and the textiles, food, drugs, etc., made from them, were without parallel at this date: every art and science and every important human culture was represented in his collection: his Library was even more closely a teaching instrument, covering an astonishing range of subjects, with religion and the sciences most strongly represented: it was kept up to date: the latest volume of popular science lectures would be on the shelves - often with a warm presentation note from the author - as soon as it came out: several learned journals were regularly taken. All this was largely financed by his medical skill - he was a very popular doctor, having patients well outside the mid-Nithsdale area - and his personal frugality: Laing Waugh, in "Thornhill and its worthies" remembers how he, as a boy, spent a hard Christmas Day forenoon helping the Doctor rearrange the library, and was hoping for a share in the Christmas dinner: but the Doctor and the Doctor's Mary (Mary Ferguson, his housekeeper from 1858) dined on a cup of tea each and a finnan haddock between them! The Doctor's interest in education led to his seeking election to Morton Parish School Board, on which he served for several triennial terms, being Chairman for one of these. In politics he was a Liberal: in Church affairs (though he seems to have been interested in all the major religions and every Christian sect, including an early edition of the Book of Mormon in his library) he was a Free Church supporter, being a member of Virginhall Church. So much for the official man: but there was a very great deal more to the Doctor than that. One typical find during the clearing of the Museum, among the boxes and drawers of cuttings, letters, and miscellaneous scraps, was a sheaf of testimonials, from many distinguished men, dating to his medical student days in the late 1830's: all, without exception, while emphasising his merits as a student, pointed out his remarkably warm, friendly personality, and all hinted at the childlike quality in him. He was on terms of close friendship with an astonishing number of famous 19th-century scholars, scientists and travellers (as previously mentioned) and was a member of many learned societies: for most of his adult life he attended the meetings of the British Association every year; besides which many of his friends came to visit him at Thornhill: there is a photograph of Mrs Hugh Miller in the Thornhill Museum garden, and the visitors' book contains many famous names. He was a man of exceptionally high intelligence - probably in the genius range - but had never lost his childish curiosity and spread his energies far too widely: he was avidly interested in everything: religious doctrine, ethnography, botany, archaeology, the physical sciences, art, literature (when he appeared in print, the printers tactfully altered his spelling: he, like his father before him, practised a highly erratic free spelling, and was an early member of Isaac Pitman's Phonetic Society): he had a strong hankering towards physiognomy and phrenology and a sneaking interest in the supernatural: he was a surprisingly good artist - Laing Waugh records that when the Waughs moved into the Doctor's former house they found the room doors gaudily painted with scenes of disaster - earthquake, war plague and famine, all in the Doctor's unmistakable style: fortunately, quite a few of his paintings have survived, from the large number in the Museum - mainly copies of prints plus a painting of his pet monkey and a very good pencil sketch of a kitten monstrosity. He was a highly emotional man, and was much affected by any mischance to his friends: an "essay" of his on Hugh Miller's suicide, written in a kind of free verse, in his bold hand and erratic spelling, still has a powerful impact. Though an apostle of science - he pasted portraits of famous men of science all over the woodwork of several of his cases - chaos reigned in his Museum - it was said that only he and Mary knew where everything was. 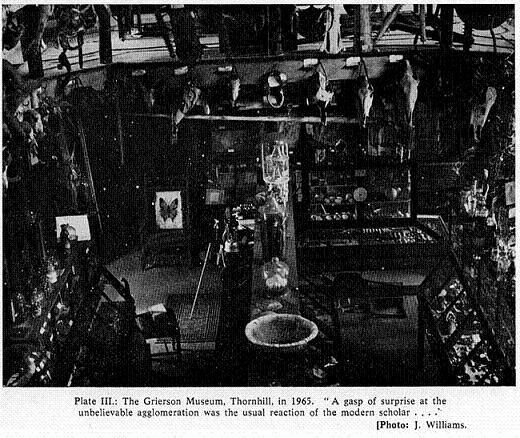 Dr George Black of the National Museum of Antiquities, reorganising the collection in 1894 five years after the Doctor's death, managed while systematising the display, to retain a good deal of the original very individual impact. Plate III shows something of the effect the display gave until its dispersal - a gasp of surprise at the unbelievable agglomeration was the usual reaction of the modern scholar or museologist, even though warned in advance: and most of it was very good stuff. Despite this chaos his MS. Catalogue, beautifully illustrated with his own drawings of the objects, is a model of its kind: he gives in full all the information he can gather on each object, giving variant versions if his sources differ, obviously taking great care for accuracy and fullness: and it shows how from the first he carefully collected things just going out in the countryside, and things still in use, knowing their future importance: Laing Waugh records that very often he took small items of interest from cottagers in lieu of payment in cash for his services, and thus saved things which would have disappeared - the folk-material element in his collection is a very important one. There was a good deal of "Griersoniana" in the collection - personal books, his midwifery diary, his instruments, photographs, his excellent medical library - and this is now at Dumfries Museum, with his paintings, drawings, some of his writings, a book of coloured posters of his many public talks, the minute book of the Thornhill Institute, many scrapbooks and boxes of cuttings and notes, and so on - a monument to a remarkable man, who in his life-time was regarded with affection and pride in his home area, and with respect in the world of learning. * Reproduced from Transactions, Series III, Vol. XLIII, pp.65-72. 1 Sir William Jardine, TDGNHAS, first series, Vol. II, p. 12, and Vol. III, p 11. Dr Derek Simpson, TDGNHAS, Vol. XLII, pp 25-50. 2 Dr John Coles, TDGNHAS, Vol. XLII, pp 61-98. 3 J Curle, PSAS, Vol. LXVI, p 370. 4 W. G. Collingwood, TDGNHAS, Vol. XII, pp 46-62. Dr R. Cramp, TDGNHAS, Vol. XXXVIII, pp 9-20.